Kathleen M. Walsh November 17, 1921 – March 06, 2018 Services are waiting to be planned. Lorraine Burque, 88, of St. Petersburg, Florida, died on February 26. DUFRESNE: of New Bedford, Feb. 25, 2018, Carol L. (O’Brien), 54. Her Funeral Service will be at 11 a.m. Friday, March 9, 2018 at the Acushnet Wesley United Methodist Church, 67 Main St., Acushnet. Burial will be private. www.rock-funeralhome.com. 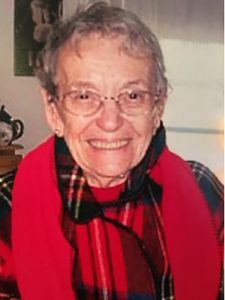 June Elizabeth Kershaw, 86, of Sandwich died on January 21. Ms. Kershaw was a founding member of the Sandwich Arts Alliance.